DairyMod is a multi-paddock, biophysical simulation model for dairy systems. It has a flexible interface for setting up and running simulations with extensive graphical and data output. The model has been applied to a range of research questions such as climate variability, drought, business risk, and the impacts of climate change. DairyMod was developed by IMJ Consultants in collaboration with Dairy Australia, the University of Melbourne, and Meat & Livestock Australia. The current version of DairyMod is 5.8.2. If you already have the program installed, click ‘Help, About’ to check your version number. If you are interested in using the program please contact Brendan Cullen at the University of Melbourne, who can provide you with a license key. DairyMod batch allows you to run simulations in batch. The current version of DairyMod Batch is 2.2.2, compiled with model version 5.8.2. The release notes will tell you about modifications and changes made to the model as new versions are released. There is also a guide to using the model which will help familiarise you with the basic operations of the program. Climate data can be read from SILO climate.txt files or from Excel. SILO climate.txt files are easier to use and must be in the format ‘Standard including FAO65 Reference Evapotranspiration (ETo)’. When you have downloaded the SILO files from http://www.longpaddock.qld.gov.au/silo/, look on the ‘Summary’ page in the model where there will be information about the climate data. 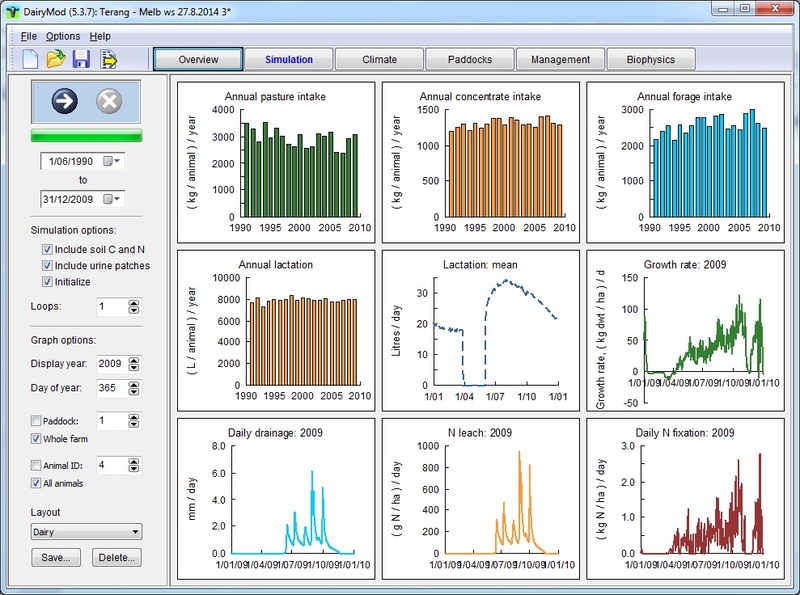 DairyMod is a daily time-step model with modules for pasture growth in response to climate; pasture utilization by grazing animals; animal physiology, growth, metabolism and lactation; water dynamics including transpiration, soil evaporation, runoff, infiltration and deep drainage; soil organic matter and nitrogen dynamics, including leaching and gaseous losses through volatilization and leaching. There are flexible options for pasture management, irrigation, fertilizer application, stock management and supplementary feeding strategies. The pasture growth module includes calculations of light interception and photosynthesis, growth and maintenance respiration, nutrient uptake and nitrogen fixation, partitioning of new growth into the various plant parts, development, tissue turnover and senescence, and the influence of atmospheric CO2 on growth. The model allows up to five pasture species in any simulation, which can be annual or perennial, C3 or C4, as well as legumes. The water module accounts for rainfall and irrigation inputs that can be intercepted by the canopy, surface litter or soil. The required hydraulic soil parameters are saturated hydraulic conductivity, bulk density which is used to calculate saturated water content, field capacity or drained upper limit, wilting point and air-dry water content. Soil organic matter and nitrogen dynamics are defined through the soil profile. Organic matter turnover and inorganic nitrogen mineralization or immobilization, movement in the soil (leaching), adsorption in the soil, and atmospheric losses through volatilization and denitrification are included. The supply of organic matter is from litter, dung and dead roots. There are three soil organic matter pools (in addition to surface litter, dung and live roots): fast and slow turnover, and inert. The only input to the inert pool is through fire. The animal module describes animal growth, pregnancy and lactation as well in response to available energy, and includes body protein, water and fat. Animal protein weight is taken to be the primary indicator of metabolic state, while fat is regarded as a potential source of metabolic energy for physiological processes, such as energy requirements during lactation. Animal intake in response to available pasture and pasture quality is described, as well as intake from supplementary feed. Feed composition has a direct effect on growth and metabolism, including lactation, as well as nitrogen dynamics and the nitrogen contents of dung and urine. The model includes methane emissions during rumen fermentation as well as the energy costs of dung and urine production. The farm management module describes the movement of stock around the paddocks as well as the strategies for conserving forage, and incorporates a wide range of rotational grazing management strategies that are used in Australia. There are options for single- and multi-paddock simulations that can each be defined independently to represent spatial variation in soil types, nutrient status, pasture species, fertilizer and irrigation management. Greenhouse gas dynamics are completely described in the model, and include the total plant and soil carbon balance, nitrous oxide and methane emissions, and also indirect losses through nitrate leaching. Johnson IR (2016). DairyMod and the SGS Pasture Model: a mathematical description of the biophysical model structure. IMJ Consultants, Dorrigo, NSW, Australia.